The University of California Office of the President has misleading budgeting practices, which resulted in accumulating a surplus of $175 million it did not disclose, according to a state audit released Tuesday. State Auditor Elaine Howle said UCOP also provided its employees with generous salaries and failed to justify its spending on systemwide initiatives in her report to Gov. Jerry Brown and the state legislature. Legislators requested the audit because they were concerned about rising tuition and unjust appropriation of funds by the administration. The audit found UCOP spent significantly less than it budgeted for and asked for increases based on overestimated budgets from previous years rather than its actual expenditures. UCOP also built an undisclosed budget to spend the reserve funds, which included $32 million in unspent funds it received from an annual charge levied on the campuses. The audit said campuses could have spent those unused funds on students. 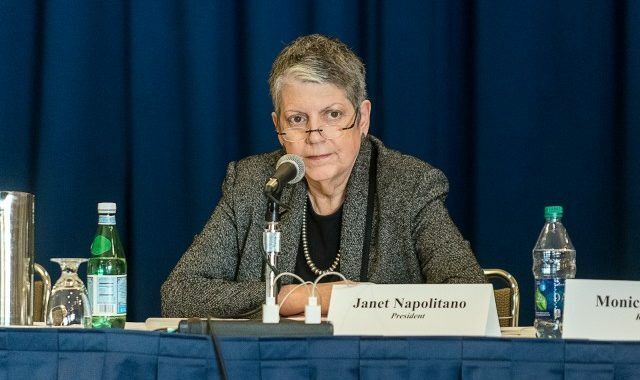 UC President Janet Napolitano denied the audit’s claim that information about these funds was kept secret. “In fact, UCOP’s budget and financial approaches reflect strategic, deliberate and transparent spending and investment in UC and state priorities,” Napolitano said in response to the audit. UCOP employee salaries are significantly higher than the salaries of other comparable positions in the public sector, and some have benefits other state employees do not, according to the audit. The UCOP spent at least $21.6 million on employee benefits during a five-year period. Some of these benefits, such as supplemental retirement contributions, are not typical to public sector jobs. UCOP provided a regular retirement plan but also offered its executives a retirement savings account into which it contributed up to 5 percent of the executives’ salaries – about $2.5 million over the past five years, according to the audit. UCOP could not satisfactorily justify its spending on systemwide initiatives, Howle said. She added UCOP could not provide a complete listing of initiatives, their costs or an assessment of their continued benefit to the University.